Does your neighborhood have a watch group? Maybe they have a Facebook page that allows them to better communicate between each other? What is Nextdoor? (Taken from their site): Nextdoor is the private social network for your neighborhood.- - Nextdoor is the best way to stay informed about what's going on in your neighborhood - whether it's finding a last-minute babysitter, planning a local event, or sharing safety tips. There are so many ways our neighbors can help us, we just need an easier way to connect with them. 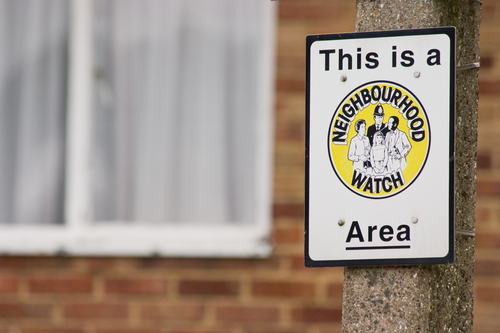 National Neighborhood Watch is a division of the National Sherriff's Association. Their motto is "Crime prevention through neighborhood cohesiveness and collaboration". Their website is PACKED full of helpful information from how to locate if your neighborhood has a watch group, to how to start one, order signs and they even have safety tips - which is always a huge plus with us! View the NNW Website here. I personally made a small Facebook page for just the people on my block and we welcome others around the neighborhood. My neighbors know what I do for a living and have been asking if I would assemble something for them to see what's going on. Crime has went up in our area and it's nice to get an instant notification on Facebook if anyone sees anything funny. It also helps us identify who keeps bringing in all the stray cats! Plus our neighborhood has a lot of new and upcoming reconstruction on some old buildings that have been left abandoned, it's a great place for all of us neighbors to chat about what we hope to see in the future. - Does your neighborhood have an existing (maybe not so active) watch group in place? Has the neighborhood president done anything to start one already? That may be your first person to talk to because it could really cut out a lot of leg work for you! - Determine how big of an area you want to organize. Is it one neighborhood or 10 streets? You can have anywhere from 5 to 200 households! For a bigger area, we suggest getting someone on-board with you! A good rule of thumb is one person to every 8-10 households that are involved. - Figure out where meetings will be held. What night will they be? Are you going to hand out flyers or do a computer presentation? Going digital may be the easier way. Is everyone open to receiving email alerts? - Schedule speakers through your sheriff department to come talk at some of your meetings. - Invitations to your meetings should be sent out at least two weeks prior to your meeting. The initial way we suggest to get the word out is door knock and leave flyers. - Make a neighborhood map to show your fellow neighbors what areas you will be "watching" and make a plan. What are you looking for? Crime? Tips on personal safety? Leaf pickup? Garbage issues? Teach your fellow neighbors how to spot crime and who to report it to. - The initial meeting is probably the easiest part, it's the maintaining topics and meetings to keep your neighbors involved. Family Watchdog invites you to use our site, newsletters and blogs to help find topics to talk about. It's very easy to others to forget all the hard work that goes into your planning for a neighborhood watch. Some groups maintain interest by hosting block parties, outings, picnics or potlucks and passing out a newsletter every month to every other month. Share with other readers how you have helped a successful neighborhood watch group expand. Tips and tricks are always welcome. Tell us below in the comments!